Superman is the oldest superhero, and he’s been featured in thousands of stories since 1938. He's also inspired a slew of analogues—Superman-like characters that other companies (and sometimes even Superman's home, DC Comics) created to comment on Superman or superheroes in general. These characters also allow stories that could never be done with the real thing, like Superman going berserk and wiping out whole cities. Here’s a look at 10 Superspawn. This blue-haired boy scout appears in Astro City, a creator-owned comic by Kurt Busiek, Brent Anderson, and Alex Ross that’s been published for 20 years and excels at capturing life’s small moments for superheroes and non-superheroes alike. In the story “In Dreams,” Busiek shows the sheer exhaustion a Superman type must feel with so much responsibility—from morning to night he’s foiling bank robberies, averting natural disasters, defeating rampaging robots, and maintaining a secret identity. Only when asleep and dreaming is poor Samaritan able to fly for the sake of flying. Superman’s friendship with Batman is a key feature of the DC universe, and that friendship got a new spin in Stormwatch in 1998. Writer Warren Ellis and artist Bryan Hitch created Apollo and the Midnighter, brutal vigilantes based on the two oldest superheroes. There's another twist: The pair are in love and eventually get married. Just like that, decades of superhero subtext became text. Another Superman type popped up during Ellis’ run on Stormwatch. The High is even more directly modeled on Superman. Like Superman, he first appeared in 1938, came from another world, was raised by farmers, and spent his early years fighting for the little guy against tycoons, landlords, and Nazis. Unlike Superman, The High disappeared, sat motionless on a mountaintop for 10 years, then reemerged with a plan to eliminate all governments on Earth by providing every person with endless food, medicine, and freedom. Needless to say, this anti-authority mission did not go over well with the authorities. 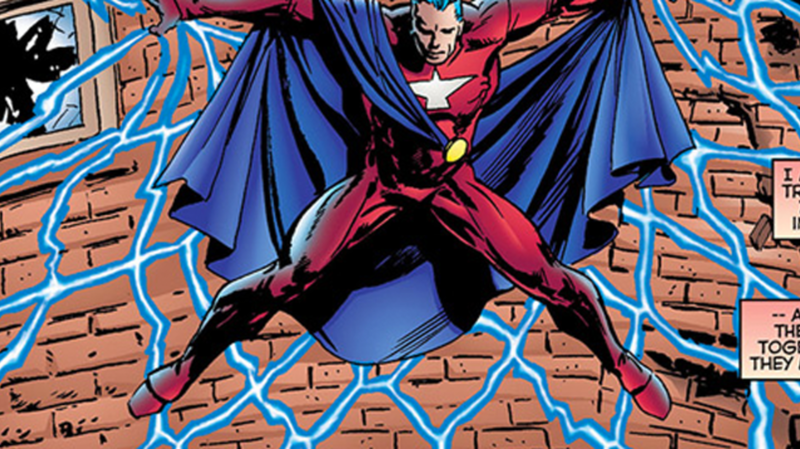 This Superman type is the father of another Superman type: Invincible, the star of Robert Kirkman’s long-running Image series of the same name. Like Superman, Omni-Man came from another planet. Unlike Superman, Omni-Man was sent here to ready the planet for conquest. As you might expect, that arrangement led to an awkward conversation/brawl with his son. Imagine if you thought your dad was Superman, but it turned out he was more like Space Napoleon. This extremely creepy character played a major role in The Boys , Grant Ennis and Darick Robertson’s Dynamite series about a CIA team tasked with keeping superheroes in check. Like most superheroes in this series, the Homelander is an abusive monster. In this world, you’d be safer in a CIA prison than anywhere near the equivalent of the Justice League. Garth Ennis took another swipe at superheroes in The Pro, an extremely funny one-shot about a prostitute (who not-coincidentally has a revealing costume a la Power Girl) given superpowers to settle a bet by meddling aliens. Along the way, we meet the Saint—a ludicrously naïve simpleton and scathing satire of Superman. I don’t want to spoil anything, but this series reveals something I’ve always suspected: super-sperm and airplane safety do not mix. Marvel and DC Comics have been riffing on and ripping off each other's characters for decades: Quicksilver is a version of the Flash, Swamp Thing is basically Man-Thing, and Namor the Sub-Mariner is a much-improved Aquaman. Hyperion is Marvel’s rarely used version of Superman, and he’s part of the Squadron Supreme, a team of Justice League analogues who are usually treated as a winking joke. Along the same lines, this character in Brian Michael Bendis and Michael Avon Oeming’s Powers also has ungodly abilities he uses for mass murder after losing his marbles. Supershock—the original superhero in this world—incinerates the Vatican and annihilates the Gaza Strip, among other atrocities. The cause of his turn is mysterious. The best guess is his brain wasn’t as ageless and invulnerable as his body, and Supershock went senile. Created by Rob Liefeld for Image Comics, this creator-owned character had its best run under comics legend Alan Moore, whose stories critiqued '90s comics while paying tribute to the more innocent titles of the '30s through '50s. Moore celebrated every aspect of Superman lore, including Lois Lane, Lex Luthor, and Krypto the Superdog, who became Diana Dane, Darius Dax, and Radar the Hound Supreme. Best of all, Moore created the Supremacy: a place outside space-time where previous versions of Supreme go after being written out of the comics. I’d like to think there’s a Super Supremacy out there where all the Supremes, Supershocks, Samaritans, Plutonians—and, of course, Kal-Els—go when they’ve been “revised,” as Moore puts it.